Aso shrine one of the oldest and most prominent shrines in Japan, and was built in 281 before accession of the 1st Emperor Jinmu. The shrine is popular as a god protecting worshipers from traffic accidents, and exorcism, marriage, and learning. Aso Shrine at Mount Aso in Kyushu is traditionally held to have been a center of worship before the accession of the Emperor Jinmu. The shikinaisha shrine complex at Ichinomiya in what is today Kumamoto prefecture was said to have been established in 281. Ichinomiya literally means “the first shrine” — of which means in other words that Aso was the first shrine in the province of Higo. Records link the founding of the shrine to the reign of Emperor Keikō. By the middle of the 11th century, the shrine was involved in national issues as they played out across Kyushu. During the ascendancy of the Kamakura shogunate, the Hōjō clan exercised a significant influence over the affairs of Aso Shrine. This Shinto shrine is dedicated to the veneration of Tateiwatatsu-no-Mikoto, who was a grandson of Japan’s first emperor and the brother of Emperor Suizei, the second monarch on the traditional list of emperors. In the same period that Emperor Jimmu was establishing his palace at Kashihara at the foot of Mount Unebi in Yamato province, Tateiwatasu was sent to Aso where he helped establish a number of agricultural communities; and later, he is said to have built a palace at Miyagi. Ponsonby-Fane, Imperial House, p. 28; Unebiyama-no Ushitora-no-sumi-no misasagi (Unebi Goryō, tomb of Emperor Jimmu). The original location of the shrine is uncertain because it was destroyed and rebuilt many times in or near the crater of Aso-zan. The present buildings date only from the Tempo era (1830-1843). In Japan’s long tradition of rice farming and agriculture, fire symbolizes ritual and purity. Fire is used to burn off pasture grass to make way for new growth and to ensure it is maintained in good condition every year. The Aso Fire Festival which takes place every March in Kumamoto Prefecture embodies this tradition of using fire to pray for a rich harvest. Festivities, which last for a month, take place in the eight villages around the Aso region to mark the arrival of spring. A fire festival which is held over a period of one month in all towns in the environs of Mt. Aso in Kyushu. No-yaki refers to setting fire to the plains in order to maintain the pasture grass in good condition and is carried out in a number of places. The main event is the Dai Himonjiyaki which is held in Ojo-dake on the second Saturday of March. On the mountain slope, a gigantic Chinese character signifying ‘fire’ measuring 350 m appears. The no-yaki fire spreads nearby and the excitement of this spectacle continues until late into the night.her event you should not miss seeing is the Hifuri Shinji at Ichinomiya Aso Shrine in mid-March. This is a ceremony to pray for a rich harvest and to celebrate the marriage of the gods (Kunitabu and the goddess Himemiko), and when the object of worship of the female deity arrives, people light their pine torches and start to brandish them. The many rings of fire are spectacular. Ordinary people can participate in this event, too. The festival day differs every year according to the Oriental Zodiac, so you should check the correct day before you come. The Yama-no-kami Matsuri (Mountain God Festival) is also held at the end of March in neighboring Nishihara Village, where you can see the rare spectacle of a no-yaki (burn-off of withered field grass) at night. Another of the delights is the food, such as Aso beef barbecue, prepared with original recipes from each town. You will find Japan’s only Tofu Museum at Hana-Asobi (Aso Agri Square) near Aso Station. By the time this festival ends the cherry blossom season is about to arrive. Aso Jinja – “Jinja” is a Japanese word for a Shinto shrine. Shinto is the indigenous religion of Japan, and comprises a collection of beliefs, rituals, and practices that center around getting along with the “kami,” or nature spirits, that dwell in Japan and have the power to make peoples lives good (or miserable). You won’t travel far in Japan without seeing rocks, waterfalls, trees, or other natural features that are draped with a “shimenawa,” a ceremonial rope that tells passers-by that the object is a natural shrine that houses a kami. Even whole mountains can house the kami. In fact, there used to be a shrine near the summit of Nakadake crater. The site, now known as the Furubochu archaeological site, is a ruined temple complex that was active during the middle ages. A few hundred monks and about 80 temples apparently existed in the area until about the 15th century, when volcanic activity (and possibly feudal wars) caused abandonment of the site. Investigation of the crater has shown that the Aso caldera was, in fact, filled by a great lake, much as Crater Lake, Oregon, is currently filled with water. The sediments that were deposited in the lake, which is known as “Paleo-lake Shiobara,” contain many thousands of well-preserved plant fossils that imply the lake existed at least during the middle Pleistocene. To me, investigation of the plant fossils of paleo-lake Shiobara sounds like a job for University of Idaho paleontologist Peter Isaacson and paleobotanist Bill Rember! Anyway, Takeiwatatsu-no-mikoto was later promoted to be the kami of Aso volcano and one of the major kami of Japan. The Aso Jinja is located in the northeastern part of the Aso caldera. Of course, those of you that know me know that, besides being a hydrogeologist, I have an interest in archaeology, history, and culture, so I wasn’t going to miss out on a trip to Aso Jinja! Each spring cities, towns and villages in the area host the Aso No Hi Matsuri or the Fire Festival of Aso. It’s a spectacular event highlighted by the burning of the kanji character for fire onto the hillside at Hana Aso Bi (Dai Himonjiyaki) and a torchlight ritual (Hifuri Shinji) at Aso-jinja Shrine. The festival began in 1984 when area farmers decided to coordinate the burning off of their fields in order to promote tourism in the area. On Monday, March 16, 2009 head for Aso-jinja Shrine where you will be treated to a Wadaiko (traditional Japanese drumming) performance starting at 6PM followed by the Hifuri Shinji (Shinto torchlight ritual). Events wrap up around 8PM. From the JR Miyaji Station walk fro 20 minutes or take a five minute taxi ride. “Hifuri-shinji” is a religious ritual conducted in Izumi district during O-Bon (August 13-16) to console the spirits of ancestors. After a prayer, straw of about 30cm (or one foot) are attached to both ends of a thick bamboo about 10m (or 33 feet) long. Then, fire is set to the straw. There is a group of young men who are appointed as “oya” or parents. They take turns, carrying the bamboo and then swing it with a strong shout, “Yah!” Two other young men are appointed as “ko” or children and each of them carries a thin bamboo stick. They follow the motions of “oya.” For the finale, with shouts, “oya” runs up the bridge, carrying the bamboo on fire, and throws it down in the river amid a storm of cheers from the spectators. This is said to console the spirits. Kyushu Tourism Organisation. Hifuri Shinji (or Torch Festival) at Ichinomiya Aso Shrine is another must-see attraction of the Aso Fire Festival. Although the actual date of the festival changes each year according the relative position of the zodiac animals in the Chinese calendar, it is usually held sometime in mid-March. The event begins with a ceremony to pray for a rich harvest and to celebrate the marriage of the gods. This is then followed by thefamous spectacular displays of fire which have been designated as important intangible cultural properties of Japan. In the evening, a solemn rite is performed in the flickering light of pine torches. Young ascetics brandish huge burning torches, drawing circles of fire and shaking off the burning pieces in the darkness of the night, for which pious people make a rush as the fire flakes are believed to have a magic power against evil. The function is held on the largest scale on the night of the I 2th. June 1st & 2nd Takigi Noh Performance at Heian Shrine, KyotoThe famous Takigi Noh, participated in by the various Noh schools, is presented after dark under the light of blazing torches on an open-air stage set up in the shrine’s compound. July 14th Nachi Himatsuri (Fire Festival of Nachi Shrine), Nachi Katsuura, Wakayama Pref.This festival is featured by the lighting of 12 giant torches carried by white-robed priests. The Wakakusa Yamayaki is an annual festival during which the grass on the hillside of Nara’s Mount Wakakusayama is set on fire. The mountain is located at the eastern end of Nara Park, and when it is set alight it can be seen throughout the city. The burning of the mountain itself is preceded by a fireworks display. The festival takes places every year on the fourth Saturday in January, but may be delayed to the following Saturday in case of bad weather. Todaiji Temple, Kofukuji Temple and Kasuga Shrine are all involved with the ceremonies of the festival. The Wakakusa Yamayaki has been taking place for hundreds of years and its precise origins are unclear. 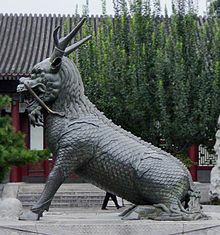 One theory claims that the burning of the mountainside began during boundary conflicts between Nara’s great temples, while another claims the fires were used to drive away wild boars. 23rd & 24th Summer Festival of Warei Shrine, Uwajima City, Ehime Pref. 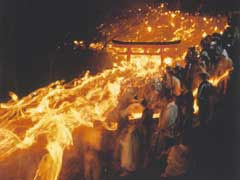 The festival is highlighted by many mikoshi crossing the river accompanied by hundreds of people with torchlight in their hands. Togyu or bull fighting and a fireworks display are other major events. A spectacular bonfire in the shape of the Chinese character, (“Ooki” kanji) meaning large, is lit near the summit , This is the most splendid attraction of the Bon Festival in Kyoto. Long rows of torches placed along the street leading to the shrine are set on fire and gaily-dressed children march to the shrine holding burning torches. くらまのひまつり. October 22 This is one of the three most remarkable festivals in Kyoto. It is said to reenact the scene of the enshrined deity greeted after traveling from the Imperial Palace to Kurama-no-Sato village, at the end of the Heian Period. On the evening of the 22nd watch fires are lit at the entrances to the local houses, and at 6:00 in the evening the town is lit up with torches carried by children. Soon after that the local people, wearing straw warrior sandals, parade through the streets carrying a great torch and yelling along the way until they gather at the sacred precincts of the shrine. Two portable shrines amid the sparks from the torches present a grand sight. The return celebration is held on the 23rd. It is said to reenact the scene of the enshrined deity greeted after traveling from the Imperial Palace to Kurama-no-Sato village, at the end of the Heian Period. On the evening of the 22nd watch fires are lit at the entrances to the local houses, and at 6:00 in the evening the town is lit up with torches carried by children. Soon after that the local people, wearing straw warrior sandals, parade through the streets carrying a great torch and yelling along the way until they gather at the sacred precincts of the shrine. Two portable shrines amid the sparks from the torches present a grand sight. The return celebration is held on the 23rd. People carry torches at night. Mostly of the Shingon Sect, where talismans are consecrated and old talismans burned in a sacred fire inside a hall or a large sacred bonfire outside. Sometimes at the end ascetics and laymen alike walk through the hot embers (hiwatari matsuri, see below). Most temples dedicated to the deity Fudo Myo-O have a fire ritual on the 28 of each month, the memorial day of Fudo Myo-O　不動明王 and special first and last rituals of the year, on December (osame Fudo) and January (hatsu Fudo). Kihara Fudo Fire Walking Festival … 木原不動尊 Kumamoto. Hiwatari matsuri. Konoita Fudo Fire Walking Festival … 高板山不動堂 Yashima, Shikoku. Hiwatari matsuri. ★12 km from the JR Ito Station and 30 minutes by car. Big pine torches are carried around (taimatsu mawashi). This festival goes back more than 1600 years. In 368 A.D. a local low-ranking officer took revenge on a nobleman, who was very cruel, and killed him with a large torch. Nowadays, this festival is intended to cleanse the shrine compound of evil spirits. People pray for the wellbeing in the coming year. 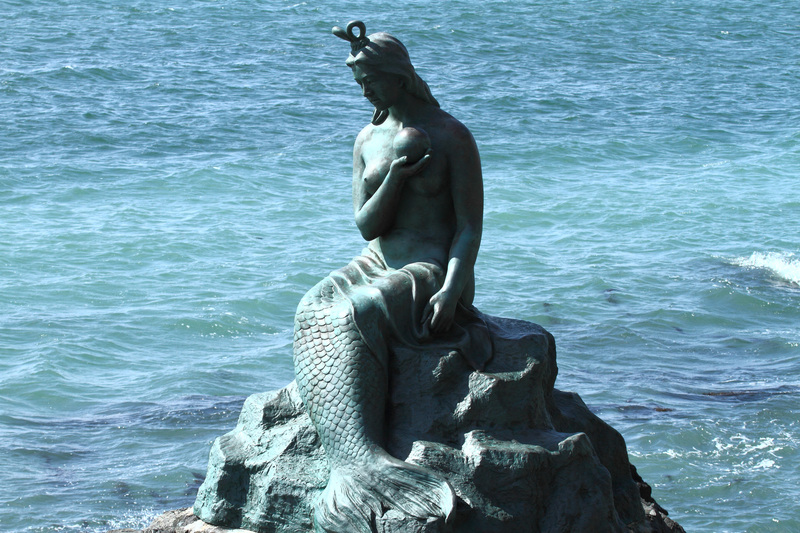 Since 1955 it is an important cultural property. At night on January 1. People try to catch some embers or light ropes and take the fire home to light the own hearth fire for the first soup of the year. This fire festival has a history of more than 1400 years. It welcomes the God of the New Year and was held on the six day of the first month, according to the Asian lunar calendar. Men of all ages, called “those who climbed up, agari ko 上り子, run down the 538 steep stone steps of the mountain shrine, in complete darkness, each carrying a torch, which was lit before the festival on the sacred flame of the shrine. They wear white cloths to express their will to be “deadly serious” about this. White cloths (shini shoozoku　死に装束, shiro shoozoku 白装束）are worn by many mountain ascetics. On the night of the festival, men eat only WHITE food, such as cooked white rice, white rice cakes and radish. The first one to reach the bottom of the stairs used to get a barrel of rice in former times. Nowadays, it is just for the thrill of it. The first few men are called “Tengu”, mountain goblins, for being able to make it in such a short time. More than 2000 men gather every year within the small mountain shrine compound and wrangle for the best place closest to the gate, which is opened at eight o’clock. Many train all year to get a feeling of the unregular, small stone steps, the curves and problems of the dangerous way down. Some fathers carry their baby sons on the back, stepping very carefully so as not to fall in the dark. They take the torches home, place them on the shelf for the gods (kamidana　神棚) and pray for the good luck of the whole family in the coming year. Autumn festivals in Kyoto reach a climax on the 22nd of October with the Jidai Matsuri and Kurama Torch Festivals.